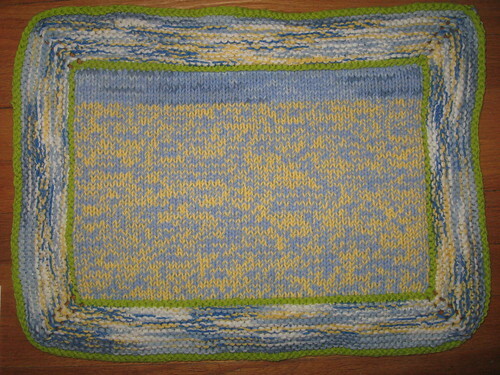 Hubby’s bathmat, originally uploaded by Craftydiddl. Made for: Hubby, he was always just using towels to step out on. Yarn: Bits of Lily Sugar n’ Cream cotton yarn. I just grabbed what colors i had that were manly enough. Notes: Easy pattern. I ran out of yellow yarn so i had to use 2 blue yarns to finish my center triangle-that’s why there is the odd blue stripe. I didnt make the border as thick as in the pattern becuase i just wanted to be done with it. If i made this again i would make the center rectangle wider and longer just for more foot and drip room. Hubby likes it but he wishes it were bigger as well becuase when he steps out of the shower he does it soaking wet and water get everywhere hence the use of the large towels. So now he has a towel under the bathmat which i was trying to eliminate. I dry off in the shower and then step out-so this type of mat would work well for me and i may just take his. 😉 So If your a wet stepper-outer you may want to go bigger. Great job! ^^ I’ll have to think about something like that for our future bathroom.